- Lou and Harold quarrel over Scrabble. - Susan is annoyed that Libby signed the consent form for Billy to do a bungee jump. Susan and Karl are having a glass of bubbly - Alan McKenna has resigned as Vice Principal of Erinsborough High. Andrew Watson has been promotes to his job, so Susan is the new Senior School co-ordinator! Karl and Susan are still upset over Libby and Billy's bungee juping escapades. Mal comes in - he's talking again. Karl says Mal should have stopped them. Mal protests that he couldn't talk at the time, but Karl says he should have written a note(!) Mal says he thought Billy would chicken out, but he didn't. Mal thinks it's great that Billy's got guts. Harold is moaning to Madge about Lou. Madge is trying to reason with him. 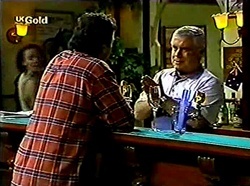 Harold tells Madge that there are loads of kids and unemployed people in Erinsborough. He's had an idea - and now he thinks he can do something about it. The girls have been shopping. Apparently Mal is coming over for dinner and Catherine is cooking for him. Catherine asks Jo and Sarah to eat in the kitchen tonight so she and Mal can use the living room. MADGE: What are you going to do with a double-decker bus? HAROLD: Put it to good use, that's what. It can be a community service vehicle. I can search out the needy and the helpless. MADGE: And take them for a drive around Erinsborough?! Harold says he tried to start something like this in Tasmania - it could be used for meals on wheels, mobile medication, warm clothing etc. Madge is still trying not to laugh, but Harold is serious. He says he's going to put the wheels in motion! Mal is ironing his trousers for his date tonight. 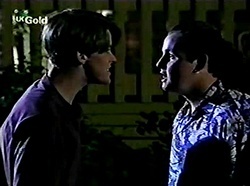 Karl tells Billy off for being nasty to Toadie. He tells Billy not to be so immature and make up with Toadie. KARL: I would have thought that anyone who had the guts to go bungee jumping would have the guts to make peace with a mate before it's too late. 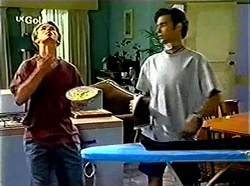 Billy is feeding Murray while Mal hangs out the clothes. He tells Billy to make up with Toadie. Mal reckons Billy is jealous of Toadie - he's smarter, tougher, manipulative and bossy. Mal thinks Toadie could be jealous of Billy too - because Billy can pull all the babes. Susan comes in with a new teacher at Erinsborough High, Lisa Elliot. She introduces her to Mal and Karl. Susan asks if Catherine still needs a new flatmate. Mal offers to take her over to No.30. When Lisa and Mal have gone, Susan moans at Karl for always getting takeaway quiche. KARL:(thoughtfully) When did you go off quiche? Billy has come to see Toadie. He asks Toadie if he's packed and if he's taking Murray with him. Billy asks Toadie to shoot some baskets later. Toadie says he might. Billy and Toadie are shooting baskets. Just then, Murray escapes, and Harold, Karl and Susan chase it. 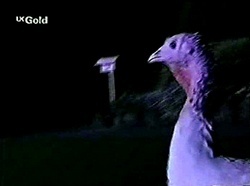 KARL: Why I didn't eat that thing for Christmas dinner, I'll never know! Mal comes back with the milk. Lisa says she wants to think about moving in. When she's gone, Sarah immediately starts on Catherine, saying that they've lost a really good housemate because of her. Everyone is looking for Murray. Lou looks on and laughs. He calls their attention and tells them he's seen Murray in his backyard. Harold comes over to see Lou about the bus. He explains that he'd been hoping to buy the bus himself. Lou says he's going to help people to, by giving them a good feed and a good laugh(!) He says there's nothing wrong with free enterprise. 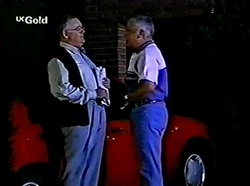 He tells Harold it's "first in, best dressed"! Sarah and Jo are trying to watch the portable TV in the kitchen. Sarah is moaning about the mess that Catherine has left. When Catherine and Mal come out, Catherine tells Sarah and Jo that she's sick of their whinging. Billy and Toadie are stalking Murray across the lawn. They try to grab him, but fail. Toadie gets cross with Billy, so he stalks off.